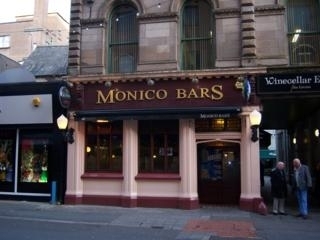 Monico Bars is found on Lombard Street and has a cobbled allleyway down one side. Have you got Google Earth on your computer? 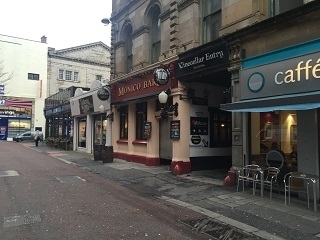 If so, then download the Google Earth view of Monico Bars. Is this the wrong position for Monico Bars? If you think so, then modify its position. Click / Tap the button above to get directions from where you are to Monico Bars. Had a great day in the Monaco, watching the dead handsomes. It finished around 8pm and the bouncer came in and was rude beyond belief. He swore at customers and insulted myself and my friend ruined what had been a great day. Management should ensure all staff have people skills and customer service. I was goimg to invite my friends to go there for my birthday next week, but I shall go elsewhere. Disgraceful behavior! Called in on Saturday past 23rd Feb for a wee drink with my friends around 6.30 and was pleasantly surprised with the live music which was playing.The guy had the place rocking on the floor.The craic was great!must go there again for a bit more of this! An absolute gem.friendly staff,relaxed atmosphere and good priced foot also.A decent place to go in search of a quiet pint. great local bar.i class it as my local.you get a great beer here and some great food in the back bar.if you like a wee bet or two its the pub for you.bookies next door.they show all sports even horse racing.if you like a flutter on the grand national its the place to go the craic is fantastic there.have a group come in on a sat night.good time had by all.cant wait till sat afternoon head there again with mates. I went to the Monaco with a few pals from work, had a fairly easy going day and we all decided to go in for a pint. We were over charged and yet we sat down... It took a few moments but then we notied that the pint glasses were also dirty. The customer service was lousy, the staff were rude and we'll never go back as a result. Wish we went to McHughs... at least there a pint tastes like t should. a nice old fashioned watering hole. Public bar at the front frequented by the punters from the bookies next door with a feed from the racing. Gives it a nice bit of local colour. Lounge bar at the back for the ladies! Good pub grub and decent beers. Ruined only by the insistence of the staff on playing MTV at high volume at night.